Hey there, long time no write! I had the intentions of sharing this before Christmas, but alas life. I still could not get the thought out of my mind and for me that means I must write. And you... if you choose to continue can read along. Christmas card photos. If I am being honest with you... they are not Andrew's favorite. Something about getting dressed up and trying to capture that "oh so perfect" picture, just doesn't appeal to him. Add two small children to the mix and it can just be too much. When I tell him its that time of year he reluctantly goes along with it, but he would honestly rather not. Now let me jump to my husband's defense, He is in no way a Grinch. In fact he loves Christmas (he is one of those that does not like to put decorations up until after Thanksgiving, but that's a discussion for another time.) I think it is the shiny perfection that we tend to strive for in our photos. The photos are pretty and all but do they really reflect the year that the family has had? Do they capture the struggles and hardships? Or like social media do they just paint the perfect picture and leave people wondering, how can their life be so perfect? In light of all these thoughts, I am not suggesting we give up on the idea of Christmas photos and cards all together. Instead, just change how we view them. upon receiving Christmas cards or seeing them on the internet, thank God for this family and appreciate the impact they have had on your life. realizing this is a very pretty picture of a very real family, save it. Save it for when all the glitter of the Christmas season has passed and take time to pray for the family. Pray for their year, their struggles both known and unknown. And most of all remember this pretty family has a real life that needs real prayer. And that's really the point. Sometimes in the midst of this season we forget about real. We forget about what would have been considered a scandalous and embarrassing engagement. We forget that baby was actually born in a manger with animals all around (all you mamas out there just take a minute to imagine if that was your delivery! )We forget that that baby is not just a baby that He is the God Man. We forget that he came to live a perfect life and be a perfect sacrifice for us. So this next year, keep those perfect Christmas cards around to remind you to engage in real prayer, for real people and to celebrate a real Savior. 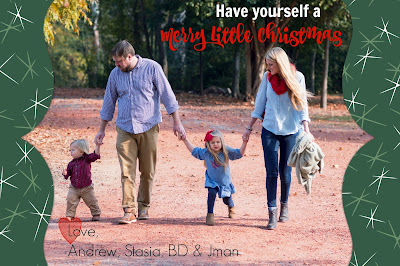 PS- We sent almost no Christmas cards this year, soooo, if you did not get one this is yours and there is a fun little video! Skeltons 2K16 from Michael David Productions on Vimeo. Good word, thank you sweet Stasia. Love you all! Agree! We save ours each year and pray for one family each day after we take them down.